AN EERIE-looking UFO can be seen in our shock footage darting through the sky, close to the spot where a 'freaked out' BBC reporter saw a craft. 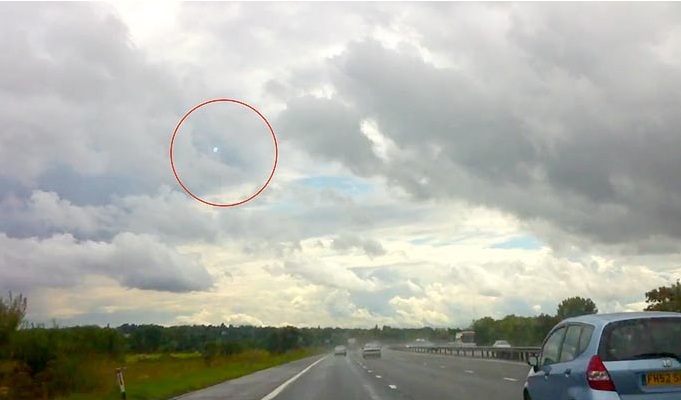 The stunning video shows a glowing white dot hovering over the M11 in broad daylight. A series of bright lights then appear to shoot out from it through the clouds, towards passing vehicles. The possible alien aircraft then whizzes at high speed over a neighbouring field before vanishing. The video clip was shot south of Stansted Airport in Essex and posted on YouTube. The 36-year-old cameraman - using the name alvinol - can be heard screaming "Oh my God" during the video as the bolts of light shoot over his car. Mike, 41 - who works for Radio 5 Live - said it too was bright and "disc-shaped". Describing what he saw, the BBC man went on: "I saw this big light in the sky descending towards the road. "As it got closer it banked to the left. It went cross-country. "I could see underneath and it wasn't an aeroplane." Sun UFO expert Nick Pope was left perplexed by the footage. "It's a really interesting video," he said. To read the story and see the video click the link below.